Like many American families, the Gaskins clan eats a lot of chicken. And why not? It’s inexpensive, versatile, and most important, delicious. I do my best to keep some variety in the family meal rotation, but sometimes it seems we end up eating the same thing over and over. Which might sound odd since I cook for a living, and I’m supposed to be creative creative in the kitchen. But by the time I have to cook dinner for my family, the last thing I want to do is be creative. I just want to get dinner on the table so I can retire to my sanctuary and decompress from the day. There are those times when I feel inspired to whip out an old school recipe and give it new life. Make something simple that’s fresh and comforting. Boneless, skinless chicken breast is always a good candidate for a makeover. I love introducing my kids to the foods I ate when I was there age. I grew up in South Jersey, so I have a fondness for Italian food. 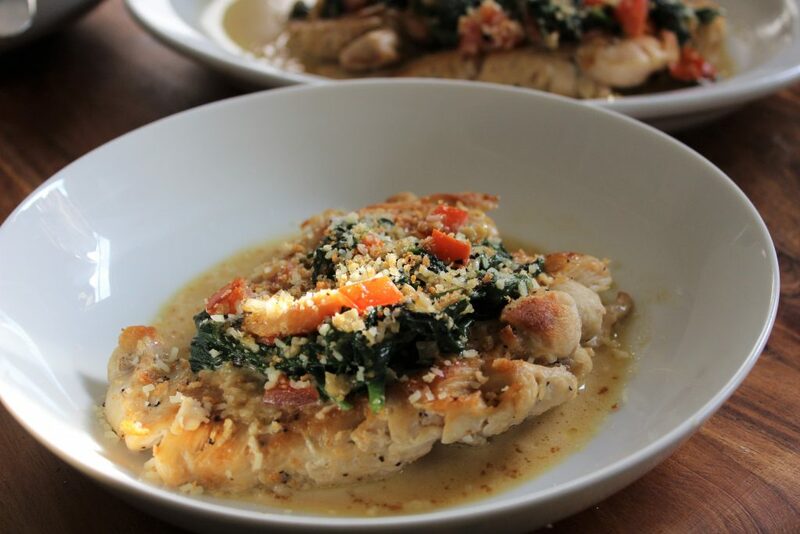 Chicken Florentine was one of my favorite dishes when I was young. 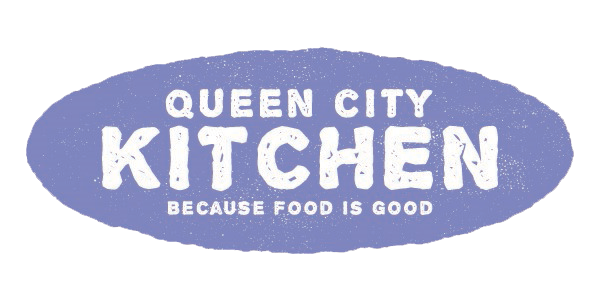 Just thinking about that breaded and fried chicken breast stuffed with a rich and gooey ricotta-spinach filling makes my mouth water. It was a labor of love with cheesy magic in every bite. 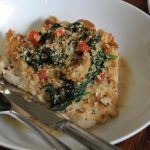 I wanted my kids’ first experience with chicken Florentine to be just as delicious with fresh Italian flavors but without all the fuss. This recipe reinvents a ho-hum chicken dinner and is sure to become a family favorite. Heat 1 tablespoon oil in a large non-stick skillet over medium-high heat. Add the spinach and season with a pinch of salt. Cook until wilted, about 2 minutes, stirring occasionally. Transfer the spinach to a fine-mesh sieve to drain. Clean the skillet with paper towels. Place the chicken breasts between 2 sheets of plastic wrap and pound to ½-inch thickness. Pat the chicken dry with paper towel on both sides. Season with salt and pepper. Heat 1 tablespoon oil and 1 tablespoon butter in the skillet over medium heat until the butter is melted. Cook the chicken until golden brown, about 6 minutes per side. Transfer the chicken to a plate and cover with aluminum foil to keep warm. Add the remaining 2 tablespoons butter to the skillet. Add the shallots and garlic, and cook until fragrant, about 1 minute, stirring frequently. Whisk in the chicken broth and heavy cream, scraping up the brown bits, and bring to a simmer. Add nutmeg and cook until slightly reduced and thickened, about 5 minutes. Remove the pan from the heat and stir in the tomato and ¼ cup Parmesan cheese. Divide the chicken among plates and stir the accumulated juices into the sauce. Season to taste with salt and pepper. Stir the drained spinach into the sauce to warm through. Topped the chicken with the spinach sauce and sprinkle with the remaining ¼ cup Parmesan. Garnish with breadcrumbs, if using. This entry was posted in 30-Minute Meals, Chicken, Dinner, Entree, Recipes and tagged 30-minute meal, chicken dinner, easy recipe, weeknight meal on June 7, 2018 by Andria Gaskins.